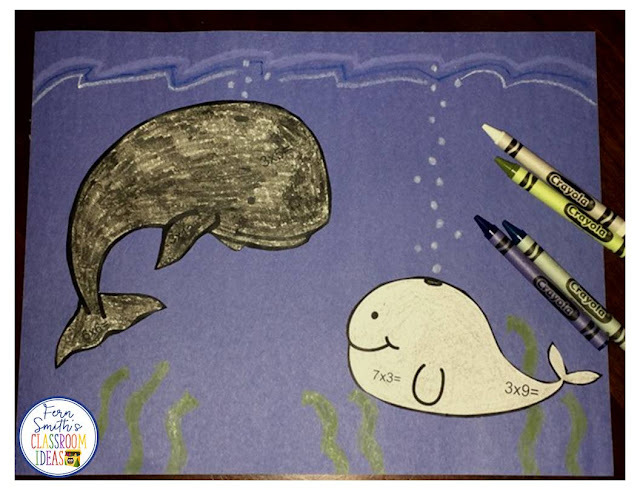 Adorable Color By Numbers Ocean Animals for Addition and Subtraction - Fern Smith's Classroom Ideas! 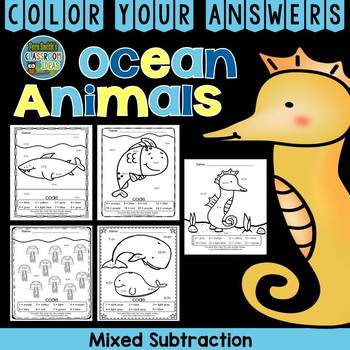 If you are teaching summer school, looking for a packet to put together for your students to avoid the summer slump, need something fun for the end of the year, or like me, live and work in Florida, these Ocean Animal Color By Numbers for Addition and Subtraction are adorable! A perfect way to reinforce skills and yet still have some joy in your classroom work day! This is one of my favorites, because the shark is smiling! I know, once an elementary school teacher, always an elementary school teacher, we tend to personify every animal, but still, he sure is cute! 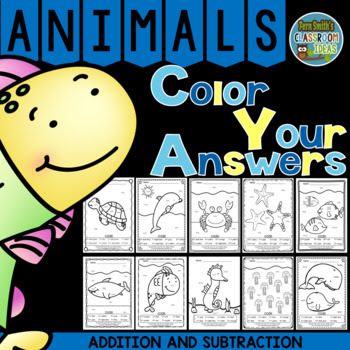 One of my very favorite color by numbers bundle is this one, Color By Numbers Ocean Animals Mixed Addition and Mixed Subtraction. 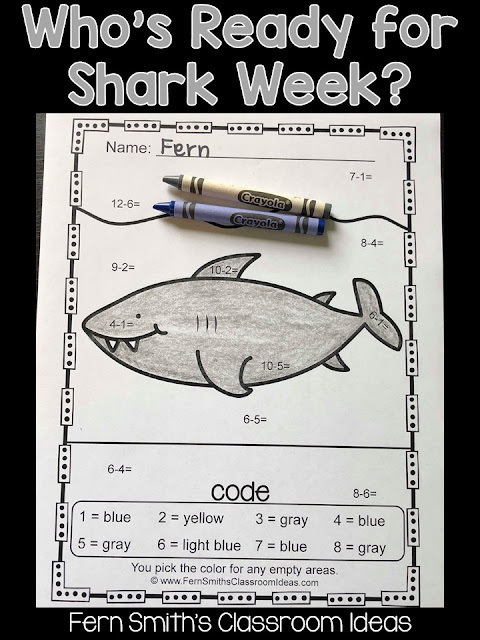 Your students will adore these Color Your Answer worksheets while learning and reviewing important skills at the same time! You will love the no prep, print and go ease of these printables. As always, answer keys are included. 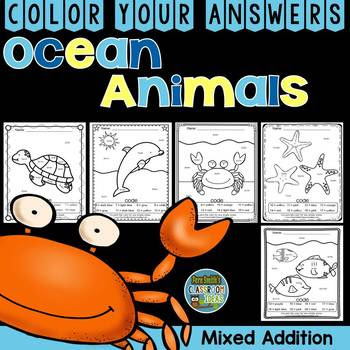 Ten Ocean Animals Color Your Answers Worksheets for Addition and Subtraction Color By Code Bundle, with Color Coded Answer Keys Included. * Five Mixed Addition pages. 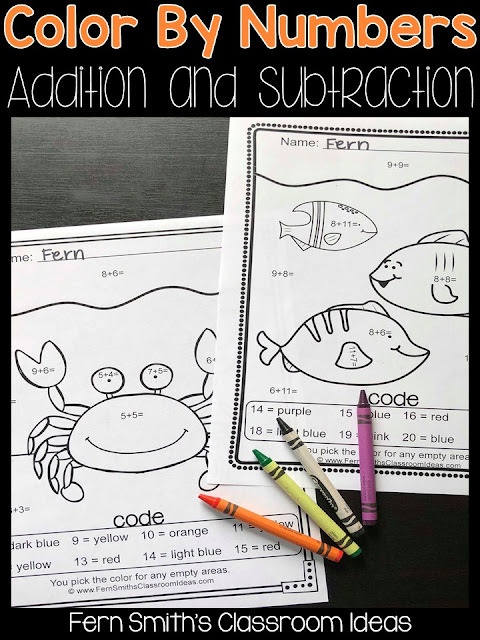 * Five Mixed Subtraction pages. If you only need addition for a review or subtraction for an introduction, they are also available separately. This is one of my very favorite worksheets in the bundle, I didn't put a frame around it since I included an ocean "floor" underneath the seahorse. He would be perfect for the students to do the math, color and then cut off the code box, for a mini-art project. Click here to read more about incorporating some fun into your classroom with my Color By Numbers and Color By Codes and how strongly I feel about having JOY everyday for our 6, 7, 8 year old students in the primary grades. More Color By Numbers Resources at TpT.